Family Members (In order of appearance): Luke sitting on small kitchen table; Kysa in striped sweater; Mom & Earl in corner; Steve in doorway; Lori in overalls; Lee at dining room table with Rosie (in pink boots); Cocoa on floor in doorway; Dennis coming through doorway; Jim in yellow shirt; Jon in beard by sink; Jessica in front of Luke at table; Jennifer with long blonde hair in dining room…and closing with the way I most remember Earl…smiling, pushing up his glasses, laughing, loving and enjoying his family. In big families there is no lack of celebrations. On February 7, 2007, I had my first opportunity to “film” one of these events with my new Digimax camera (with built-in Movie Clip mode) I’d received for Christmas from my son Bill and his wife Jen. I had no idea what a priceless gift this fruit would bear: video footage of my stepfather — “Dad Earl” Thelander — taken six months before he died from third-degree burns sustained when cowardly copper thieves exchanged around $15 worth of copper wiring for a good man’s life. 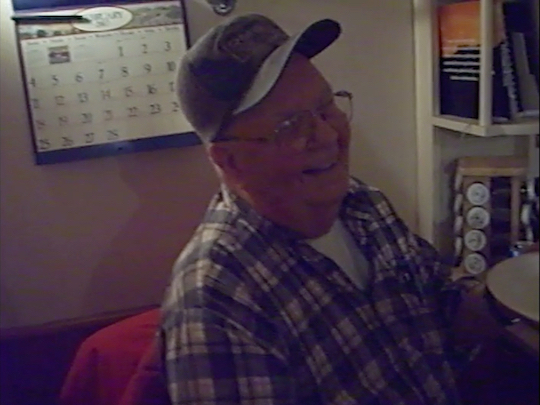 This video, however, is intended to celebrate the countless happy times my family and I shared with him…the way I most remember Dad Earl. The event is my sister Kysa’s birthday, held in my 100-year-old home despite kitchen and dining room renovations. That’s the great thing about a large, loving family, as you’ll see; they’ll gather to celebrate a birthday or special occasion, and, in the midst of all the have-more-cake-and-ice-creams and kids and dogs and laughter and love, they’ll somehow overlook the make-shift kitchen counters and yet-to-be refinished hardwood floors poking out beneath a host of mismatched area rugs. Despite my amateurish (and first ever) attempt at film recording, I managed to put together a short video encompassing the event, and then, later, extracted sections from it for the five-minute clip shown above. There are no “official” rolling credits, though I hope Grayson Hugh will understand my using here his lyrical and poignant “I’ll Remember You” composition. There simply was no runner-up. For reprint permissions, please contact Jody with the name of the requested post/article along with the publication name and/or website address in which you'd like to use it. Thank you in advance!